It's a task that, lets be honest, most of us either dread and put off for as long as possible or maybe don't even do at all but properly cleaning your make up brushes regularly is so important. The amount of yuck and bacteria that we carry around on brushes and in our makeup bags is enough to make your hair curl! Hands up, I don't do it as often as I should but I've seen a massive difference in my skin and reduction in blemishes since I took up this little chore. I usually use baby shampoo which does an ok job but I recently picked up a tub of the Japonesque Solid Brush Cleanser on a bit of a whim. It was on the little display next to the till in Space NK with all the little nic nacs and minis that always draw me in and make my purse a fair bit lighter. 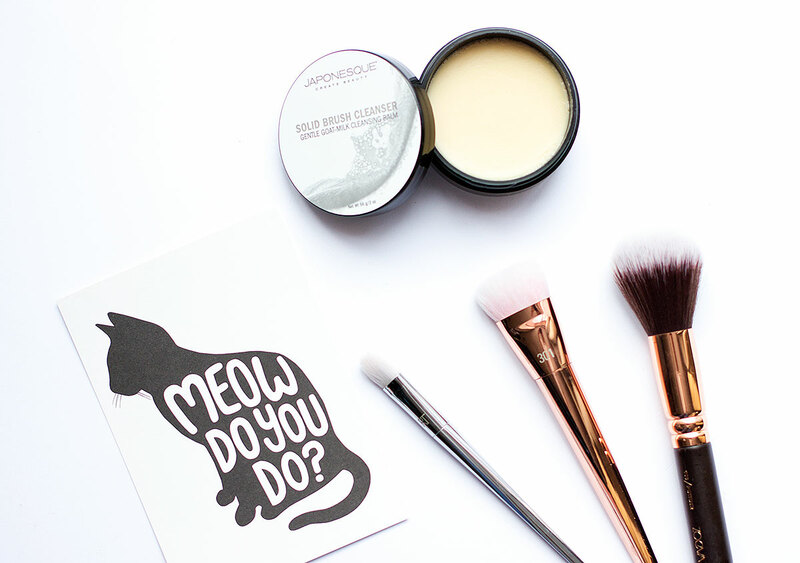 The Japonesque Solid Brush Cleanser is really easy to use and not at all messy. All you do is run your brush under water and swirl away until the dirt disappears before rinsing both the brush and cleanser. Simple. It's formulated with goat milk so its super gentle and smells pretty darn good. It removes grime so much quicker than shampoo so your brushes don't require lots of water to remove the soap and dirt, meaning they dry really quickly and are left super soft and clean. My downfall with brush cleaning is that I try and do it on a Sunday and typically remember as I go to bed. By then I can't be bothered and there's not enough time for the brushes to dry for the morning. Now that's all changed and I can get them done super quickly and they're always dry in time. The result? I'm no longer dreading this job as the Japonesque Solid Brush Cleanser makes it so quick and easy and I'm washing my brushes at least once a week. Who would've thought it? Yeah ok this isn't an essential buy, but if you have less than perfect skin and are queuing up in Space NK staring at those inviting minis, the Japonesque Solid Brush Cleanser is well worth breaking the bank for. What do you use to wash your makeup brushes with? The post When brush cleaning stopped being a chore appeared first on Lelore.